Today I visited Nicanor Parra's exhibit, called "Obras Públicas" (Public Works), at the Palacio La Moneda Cultural Center. He is a controversial artist (poet and visual artist), and has some very interesting works. 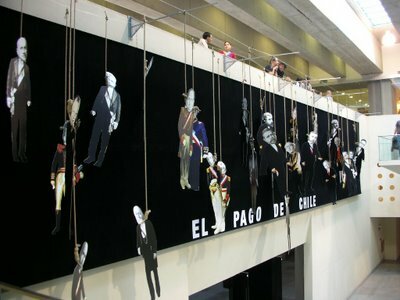 The most controversial is this one, called "El pago de Chile" (Chile's payment), in which you can see all chilean ex-presidents, hanging from the wall... Quite disturbing. It is based on a chilean proverb that says that when you work for a good cause (like being the president in this case), people will always remember your mistakes instead of your achievements. You can find more about Nicanor Parra here (some info in english). I'll be posting more pictures of this exhibit for a couple of days.